Lammas greetings to all my friends. You lift my days and warm my heart. Without you the sun wouldn't look so bright and the days wouldn't feel so warm. So I just wanted to take this opportunity on this happy celebration of summer to say thank-you for being there, at the end of the phone, text, email, letter, tweet! Happy Lammas, may your day be a sunny one! 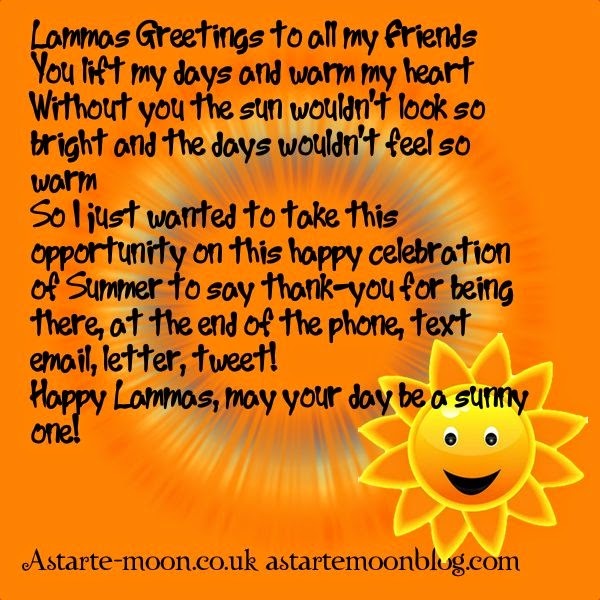 Please feel free to send this free Lammas e-card to all of your friends and family to show them you are thinking of them this Lughnassadh.